How To Tie A Turban From A Scarf On Your Head? Do you know that you can create many stylish images, using only a scarf or scarf? The main thing is to learn how to tie them correctly on the head in order to get a charming turban. It can be worn not only with jeans and a T-shirt but even with a little black dress. This fashion accessory is perfect for hiding your imperfect hairstyle from prying eyes. How to tie a turban? In our article, we will share in different ways of tying it. Turban is a head covering made from a long piece of cloth. It has many uses. If you have a scarf or scarf in your wardrobe, then you do not need to spend money on a turban. Wearing a very comfortable, not for nothing is considered a practical headdress for many eastern nations. 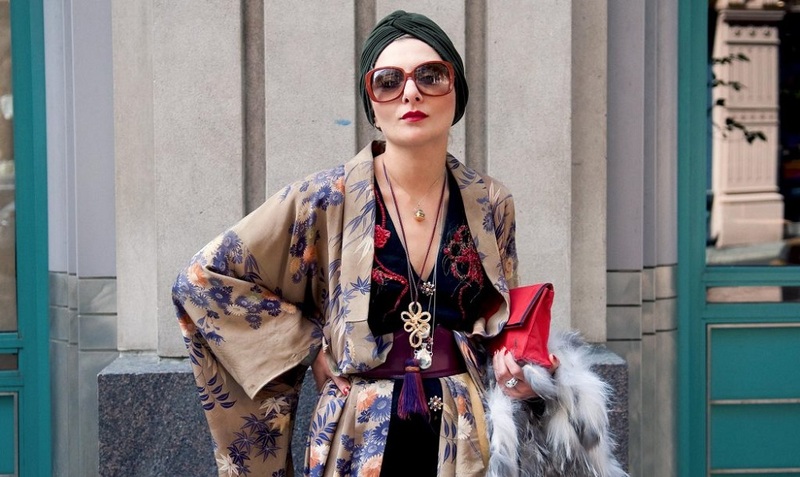 In the field of fashion, a turban is often associated with luxury. Many famous women (Joan Collins, Sophia Loren, Barbara Streisand, Greta Garbo) liked to wear a turban, which gave them extraordinary charm and mystery. In addition, the stars probably knew that a scarf, tied low on the forehead, exudes eyes that fascinate with their sexuality. In addition to red lipstick and voluminous decorations, a turban gives a touch of charm and grace to a woman’s appearance. Despite the seeming simplicity of this headgear, certain skills are required in order to tie a turban beautifully. There are a lot of attractive scarves and stoles of different colors and prints on the market now. It is better to start with cotton or linen scarves since it is not easy with silk products. There are many variants of wearing a turban, we present you the main ones. First, remove the hair under a thin fabric, tying them in a high bun. Throw a tippet on your head so that both ends are loose on your shoulders. Cross the ends of the shawl in the back, and then point them forward again, twist, retracting, and tie. Fold a thin scarf along in half. If the scarf is already the right size, throw it over the head and pull it forward, fixing the middle part well. Tie both ends into a knot in order to properly secure, and start twisting. As you twist the tips, simultaneously form an outlet on the top of your head. When you get to the end, fill the loose ends under the twisted harness, and voila – you have a gorgeous turban on your head! 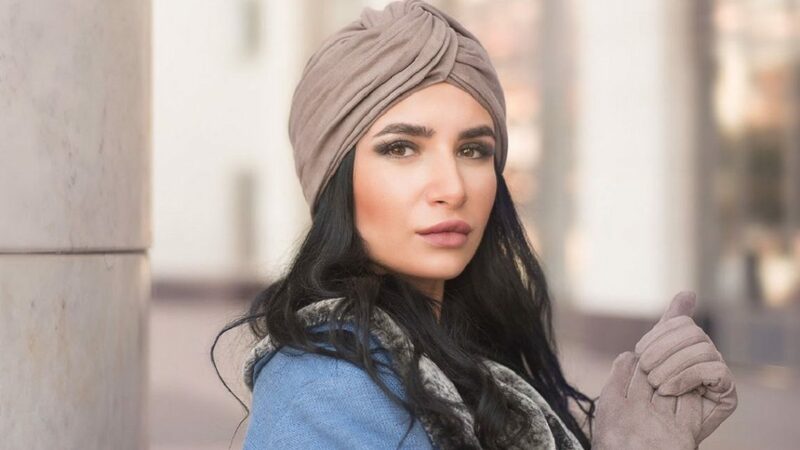 It looks very interesting turban of two scarves of different colors. First, they need to be tied together in a knot, and then in the middle of the headscarf be wound by the head. The ends of the cloth at the forehead must be crossed, then wrap behind the head and cross again. The ends are hidden in the folds of the fabric. The next option can be made of a silk scarf. It should be folded so as to make a narrow strip and wrap around the head. Next, tie on the side of the usual knot, straightening the ends so that you get a magnificent bow. Fold a large square stole diagonally to form a triangle. Throw him over the head and cross the tips behind. Wrap them around your head and tie them up in the center. Lay the longer end over the short end and wrap inwards. After that, attach the vintage brooch to the center of the design to add glamor to the image. This original turban will suit all girls without exception. Just tie a bright scarf of light fabric on the front of two knots, and hide the ends in the drape on both sides. It will turn out fresh and beautiful. On sale, you can find a ready-made bezel made of bright colors, reminiscent of a turban. In a magnificent long hair, you can effectively weave a beautiful scarf like a turban. 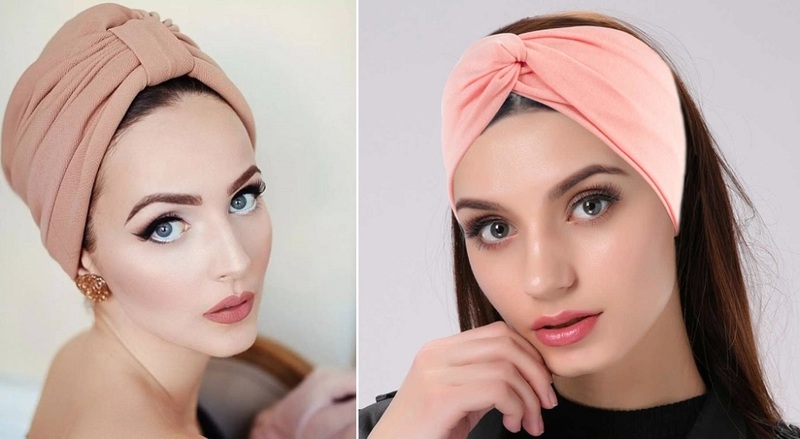 We hope that with the help of our advice, any girl will learn to tie a turban out of a scarf or scarf and become even more attractive and feminine!